For the first time, a synthetic compound has been made that can bind to DNA in the cells' energy powerhouses, suppressing a gene associated with nerve and muscle disease. Most DNA is found in the nucleus. But mitochondria, the cell's powerhouses, also host a small amount of DNA. PIPs are capable of crossing the nuclear membrane to bind to nuclear DNA, but are incapable of crossing the mitochondrial membrane. 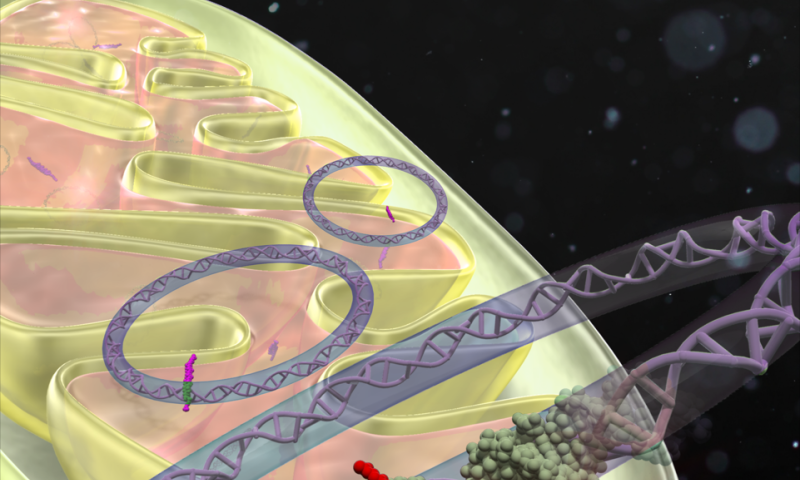 A team, led by Ganesh Pandian Namasivayam, from Kyoto University's Institute for Integrated Cell-Material Science (iCeMS) succeeded to re-direct PIP to cross the mitochondrial membrane so that it can access its DNA and alter gene transcription. They achieved this complex feat by complementing PIP with a 'mitochondria-penetrating peptide' (MPP), which is capable of overcoming the mitochondria's energy barrier. The MPP-conjugated PIP called MITO-PIP was designed to block a specific binding site for mitochondrial transcription factor A (TFAM). TFAM is essential in governing mitochondrial metabolism and energy synthesis, playing a role in the transcription of a gene called ND6, says Takuya Hidaka, the first author of the study. ND6 is associated with several mitochondrial disorders, including Leber's hereditary optic neuropathy, which causes loss of central vision, mitochondrial myopathy, muscle weakness, seizures and learning difficulties. Hence, chemical control over such disease-associated genes has clinical potential in mitochondrial gene therapy. "We plan to develop an advanced version of MITO-PIPs that can identify and localize only inside diseased mitochondria," says Ganesh. "Our proof-of-concept study provides a fresh platform that opens new avenues for DNA-based functional ligands that are capable of altering the mitochondrial genome in a sequence-specific manner," concludes the principal investigator Hiroshi Sugiyama. The study was published in the Journal of the American Chemical Society.